April 4, 2002 — It is a movable throne. In it sits the king of the common man. 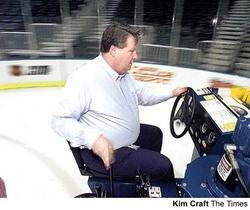 He is the Zamboni driver. The Atlanta Thrashers won only 19 of their first 76 games this season. That’s the worst record in the National Hockey League. 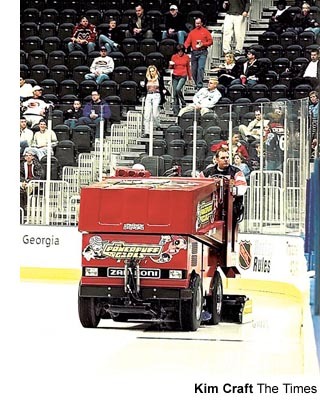 But the Zamboni drivers at Philips Arena can do no wrong. They are cheered every time they take the ice. Perhaps this happens because Thrashers fans, like the followers of any franchise in its infancy, are in desperate need of something to get excited about. Or perhaps Americans just love anything with four wheels and a motor. Either way, Matthew Krull isn’t complaining. He’s not the only one. 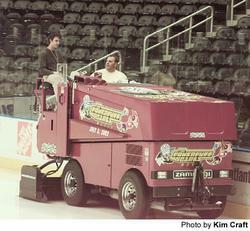 During Thrashers games at Philips, a lucky fan gets to ride shotgun for every Zamboni run around the rink. They wave to the crowd, pump their fists and give the Zamboni driver high-fives. But mostly people ask about the Zamboni … or whatever they choose to call it. Stromboli. Zucchini. Cambodia. Robinson has heard people mangle the word Zamboni several ways in his 23 years working at ice rinks. Whatever word they use, people seem mesmerized by the two massive machines that make rough ice glassy again between periods at a Thrashers game. “We kind of feel like we’re putting on our own little show out there,” Robinson said. But the performance is not without purpose. “Fans don’t really understand how important the ice is,” Thrashers defenseman Brian Pothier said. “They just think that we go out there and ice is ice. But if you have a crew that takes care of the ice well, it’s really important to the team. Robinson is an Atlanta native who has spent most of his adult life making ice, a warm-weather guy who spends most of his days in the freezing cold. He manages an ice crew of 10, mostly part-timers. They include Zamboni drivers, snow shovelers and the people who make sure the holes that hold the goals don’t freeze over. Robinson paid his dues in community rinks in Atlanta, Orlando, Cincinnati and Pittsburgh before landing his current gig, ice guru for his hometown hockey club. 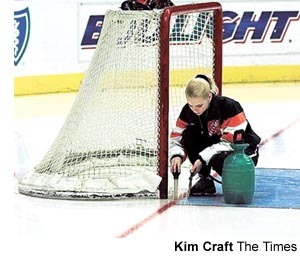 The NHL prefers the term “ice technician,” because ice guys do much more than drive a Zamboni, especially on game days. March 27, I tagged along with Robinson and his crew as they prepared Philips for the Thrashers’ 7:30 p.m. game against the Minnesota Wild. When I arrived at 4 p.m., Krull had already been on the job for nine hours. The ice was filthy when he got there. It had been covered up for nine days. Philips is a multipurpose arena. In addition to the Thrashers, it’s home to the National Basketball Association’s Atlanta Hawks, Arena Football’s Georgia Force and several major music concerts. Underneath it all, the ice remains. It’s only cover, some pieces of plywood. So step one is scraping the ice surface free of everything that shouldn’t be there — gum, beer and half-eaten hot dogs included. Sometimes just scraping doesn’t cut it. Robinson recalled a time when members of the rap-metal group Limp Bizkit spilled an entire bottle of something alcoholic that seeped deep within the hockey floor. A circular saw had to be used to remove the stained section of ice. The ice, actually, is less than an inch thick for Thrashers games. The floor design is painted on top of two thin layers of ice and then encapsulated by more layers of ice, including the playing surface. After clearing the floor of debris, Krull spent the rest of the morning rebuilding the ice with the Zamboni, which, by the way, got its name from the man who invented it. Frank Zamboni made his first self-propelled ice resurfacer in 1949. Prior to that, ice rinks relied on carts pulled by horses or tractors — and a lot of guys with shovels. The Zamboni is much more than just an ice polisher. It shaves the ice and picks up the snow. It washes the ice and smoothes the surface. Then it spreads a layer of clean hot water — more than 160 degrees hot — over the ice. The hotter the water, the clearer it freezes. And in about four minutes, about the amount of time the Zambonis are allotted between periods, the ice is hard enough to skate upon. That’s because of the concrete slab underneath, which features nine miles of pipes filled with chemicals that are constantly cooled to 17 degrees. That makes for some cold working conditions. You feel it first in your feet (Robinson wears thermal socks to work), and then it spreads. It stays with you, too. “You wake up and your bones are just cracking,” Krull said. But cold is part of the job description when you’re working with frozen water. Robinson said his crew has a “passion for ice.” And that usually starts with a passion for hockey. The goal of the Zamboni driver is to create the perfect sheet of ice, smooth and safe, every time. When dealing with a liquid and ever-changing atmospheric conditions, even indoors, that’s easier said than done. It can be rather hypnotizing, I found. I watched the Zamboni work from several vantage points last week — the passenger seat, the front row, the upper deck — and I found pleasure in each one. With each pass, rough becomes smooth, old becomes new. The Zamboni has a way of erasing the past. And in the Thrashers’ 4-2 loss to the Wild, there was plenty worth forgetting. Seated in the press box, up near the roof, I watched the arena lights reflect in the Zamboni’s shiny wake before the second period began. And then I watched players come out and scratch it all up again. That’s the part that makes Robinson smile.